In the past, the focus for engagement and wedding rings has been on the choice of the bride. The groom has traditionally opted for a single band of yellow gold for a wedding ring and the lack of choice in the market has reflected this. Times have changed however and men now have just as much choice when it comes to finding the perfect wedding ring. One of the decisions to make is which metal to opt for and this can come down to other styles of jewelry already worn, the profession of the groom, available budget and of course, personal taste. Even with all the other choices now available, gold is still the most popular metal for wedding rings. It’s all about the color of gold and the Karat weight. Gold is usually available in yellow, white and rose gold and as 9, 14 or 18 Karat. The higher the Karat, the more pure the gold content and in turn, the more soft the metal. For anyone who works in a profession using their hands or with the chance of the ring being constantly knocked, 9 Karat is the safest option to safeguard from damage and scratches. A highly desirable white metal, platinum is used in a very pure form in jewelry, so very different to the different Karat weights of gold. As it’s often a 95% purity used, it is more expensive than gold but is long wearing and very white in color. This means that – unlike white gold which is coated – there is no need to add a rhodium plating which can wear through to the yellow gold after a number of years. Platinum has a higher density than gold so will feel heavier when wearing. It’s a good idea to try on a platinum ring before opting for this metal to see if the feel of the extra density is suitable. For anyone who works in an environment where their ring could catch, platinum should be considered as it’s a metal which can easily be cut through in the event of an emergency. Titanium is the hardest natural metal in the world and has a silver-gray tint. It’s an excellent choice for contemporary designs and for anyone wanting a particularly durable wedding ring. It’s also a cost effective option as it’s not as expensive as gold or platinum, but there are just as many designs on the market. All these plus points make it really worth considering as a good all-round solution. Cobalt rings are a great option for anyone wanting the look of white gold or platinum but at a greatly reduced price. Incredibly hard-wearing, cobalt is a reflective metal which is combined with alloys such as tungsten and chromium to ensure it is extra durable. 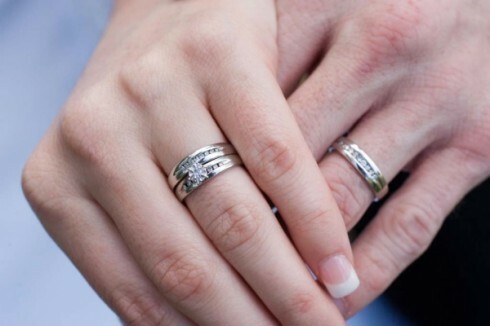 Wedding rings made from cobalt have a nice feel when on the hand as they are well-weighted to feel natural on the finger. For sleek and simple designs of wedding rings, cobalt is certainly the pick of all metals.